› Fun fact: Nick Saban has won 80.5 percent of his SEC games during his 16 seasons with Alabama and LSU, which is the highest rate in league history. The legendary Robert Neyland at Tennessee is next at 78.7 percent. It has been Nick Saban's policy, as Alabama's head football coach and previously at LSU, not to make his freshman players available to the media. 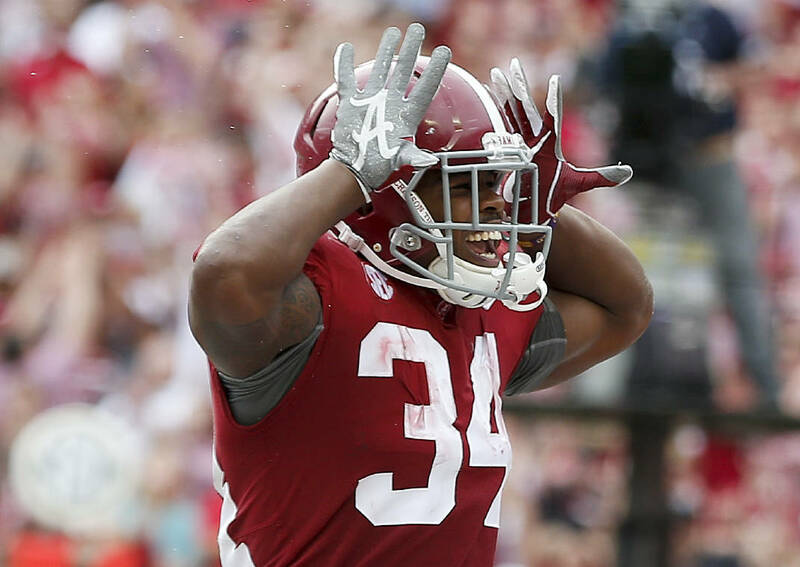 After being silent during the 2015 season, Crimson Tide senior tailback Damien Harris has been speaking ever since, and it's not solely due to his 1,000-yard rushing performances the past two years. The 5-foot-11, 213-pounder from Richmond, Kentucky, is articulate and respectful, so he would be among the last to cause any controversy or provide any bulletin-board material. How does Harris size up the impending quarterback battle between Jalen Hurts and Tua Tagovailoa in the preseason practices ahead? "We have two guys who can play the quarterback position at a very high level and two guys who can be incredible leaders for our team," Harris said this past week in Atlanta at the Southeastern Conference's Media Days. "Whatever Coach Saban decides is going to be best for our team, but they are two guys with very infectious personalities and two guys that people love to play alongside of. I think the way they've handled this situation is incredibly mature. "They're always pushing each other to be better players. You always see them together." No wonder Saban continually trots Harris out as a face of the program. Whoever emerges as Alabama's quarterback for the Sept. 1 opener against Louisville in Orlando will have a reliable force behind him. Harris rushed for 1,000 yards last year after gaining 1,037 as a sophomore, with his eye-popping average per carry jumping from 7.1 yards in 2016 to 7.4 last season and his touchdown count skyrocketing from two to 11. Harris was eligible for the 2018 NFL draft but quickly announced after the Crimson Tide's fifth national championship in the past nine seasons that he was not finished with the college existence. "I decided to come back because, for three years, I've been very blessed to be a part of this program," he said. "Everything we went through last year and winning the national championship put things in perspective for me, and I had to ask myself if I was ready to leave this place. I've had a lot of accomplishments here as a team and as an individual, and I wasn't ready to give that up yet." Said Saban: "He could have gone out for the draft but sort of sent a message that, 'I'm a guy who wants to graduate. I like college. The NFL is not going to go anyplace, and I'm going to try to have another great year and see what happens.'" Though Harris repeatedly talks about the importance of winning over individual results, which is another reason Saban has him in front of microphones, the biggest challenge in attaining a third straight 1,000-yard season may come from within the program. Najee Harris, a five-star member of the 2017 signing class, rushed 61 times for 370 yards (6.1) last season but was the Tide's prominent rusher during the latter stages of January's 26-23 overtime victory over Georgia in the championship game of the four-team playoff. The veteran Harris sees that as a plus, however, because he enters his final year with not much wear and tear on his body. His 281 carries the past two years paled in comparison to some of the other top tailbacks in the SEC, such as Auburn's Kerryon Johnson (467), Georgia's Nick Chubb (447), LSU's Derrius Guice (420) and even Georgia backup Sony Michel (308). Harris has 327 career carries, which is 68 fewer than Alabama's Derrick Henry compiled during his Heisman Trophy-winning season in 2015. "It's all by design," Harris said. "Coach Saban has always had a system where he had two or three backs that rotated at a time, so he's just doing what's in the best interest of his players and his team. You can't argue with him. He's had a lot of success and knows what he's doing. 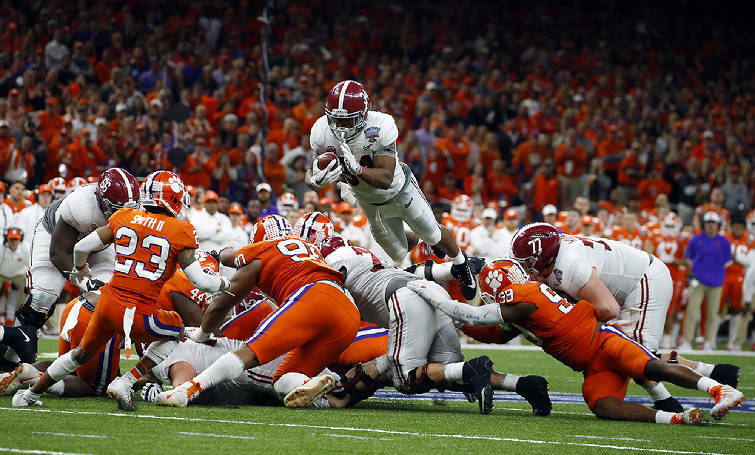 "It was a different situation in 2015, because Kenyan Drake was hurt, and Bo (Scarbrough) and I were really young and weren't ready to play yet, so Derrick had to do that. I don't think anybody else could have done that the way he did." Harris is playing for his fourth offensive coordinator since signing with Alabama, with Mike Locksley following Lane Kiffin, the brief stint of Steve Sarkisian and last year's play-caller, Brian Daboll. The Crimson Tide have a new center, with Ross Pierschbacher anchoring the line after shifting in from guard, and it remains to be seen who emerges as the starting quarterback and when such a decision will be made. Until then, look for Saban to keep calling on the efficient Harris to represent the program. "Damien is obviously a great running back and a great leader," Pierschbacher said. "It just makes it fun for us just knowing that if we do our job, he can bust a big run at any time."